The film and leaflet advise that if you are caught up in an incident to 'run, hide and tell' - guidance which can be applied to many places and situations. The film and the leaflet are set out below. Link to transcript (PDF) here. "The public should not be alarmed by this step. While the general level of threat to the UK is SEVERE, the probability of being caught up in a firearms or weapons attack is very, very small. 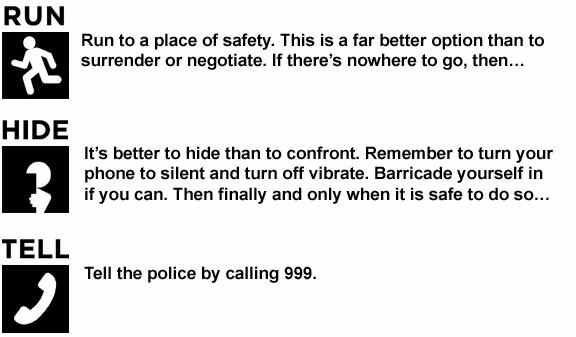 However, it is important the public know what to do in the event of getting caught up in such an incident. "With the threat level remaining at a high level, the police and security service continue to operate at a heightened state of readiness - we are working on hundreds of investigations and making an arrest a day. However, it is only with the ongoing support of communities that we can defeat terrorism - you are our eyes and ears so please be alert, but not alarmed.